Yesterday, my students took their final exams in Revelation. For a first-time teacher tackling a tough book, I think I did pretty well. The students did well, too. They were sharp, inquisitive, and fun to teach. They did a great job of breaking me in. This is the midpoint of the semester; next week, we’ll be moving on to a class on the Synoptic Gospels and six weeks from now, the semester will be over. Two weeks after that, our students will graduate and I will be free for the summer. To celebrate, a couple of my friends (one from Asheville, N.C., for five days and one from Sacramento for three weeks) are flying down, one after the other, to visit Haiti for the first time! After they leave, I will be flying out on June 25 to spend the summer in the States. Please pray that I would be able to get good medical care when I get back: I have been experiencing chronic fatigue that isn’t too severe, but I would still like to find a solution to it before coming back to Haiti. Also, please pray that I would stay focused on Jesus and on the Gospel as I round second base and start sprinting toward home. P.S. My summer schedule is wide open at this point. If any of you would like to invite me to your church or small group or rare bird society to share about what I do, I would be more than happy to do so. (I also accept summer cookout invitations pretty much without exception. Just saying.) Even if you’d just like to hang out and catch up, I’d love to see you! Shoot me an e-mail at adams -dot- john -at- gmail -dot- com. Pritchard Gibson (P.G.) Adams, Jr. (March 1, 1928 — March 15, 2014), my grandfather, was born the year before the great stock market crash of 1929 to a family from the one-horse town of Faison, North Carolina. Raised during the Great Depression and World War II, he knew hardship at an early age, but his father never let him entertain self-pity, dragging him out of bed before dawn in wintertime to split wood for the fireplace. For his first job, he drove the Duplin County school bus, learning the art of patching tires several times over due to wartime rubber rationing. His father’s reputation as a man whose word was his bond got him the job—and meant that he never sat for the driver’s license exam. “Son, Mr. Adams told me you’re ready to drive,” the examiner said to him, “and if Mr. Adams says you’re ready, you’re ready.” For the rest of his life, he would never get so much as a speeding ticket. Granddad completed high school in 1945, just as the Germans were surrendering and World War II was winding down. As a result, he just missed being drafted, but he went to the Citadel in Charleston, South Carolina upon graduation and joined the Army anyway. After four years in Charleston, the Army deployed him to Korea, where he was wounded in action and sent to Japan to convalesce. Due to a clerical error, he was never awarded the Purple Heart. Out of modesty, he never pursued the matter any further. After his tour in Korea, he was stationed at Fort Benning, Georgia, where he met Lucy Andrews, the fiery, red-haired Virginian who would become his wife. They were married in the summer of 1952 in her hometown of Lynchburg, Virginia, before they were re-assigned to Europe, where both of their children would be born — my aunt Mary in Trieste, Italy, in 1953 and my father, Pritchard III, in Berlin in 1955. Returning Stateside in 1956, the list of states they had lived in — Kansas, Pennsylvania, Arizona, Virginia, and Georgia — grew as fast as the children did. In 1968, Granddad was deployed to the escalating crisis in Vietnam toward the end of the Tet Offensive. He would command a battalion in combat along the Cambodian border and later worked as Assistant Division Commander of the First Cavalry Division, second-in-command to over 20,000 men in combat. When the Command and Control Helicopter he was aboard took enemy fire and began to spin the opposite way of the main rotor blade, he nearly became a casualty of that war. In a moment of crisis, he cried out to God and his life was spared as the pilot managed to crash-land the aircraft without any casualties. The war would leave its mark in other ways, however. His experience on the battlefield would remain a closely guarded secret for the rest of his life. During the 1970s, Granddad did stints as the J-5 of SOUTHCOM in the Panama Canal Zone and as the U.S. military attaché behind the Iron Curtain in Hungary, a position that involved intelligence gathering on the location and movements of Soviet troops. (His story about the time his car broke down as he and a partner spied on Soviet satellite installations was riveting.) By that point, with both of his children in college and nearly 30 years in the Army under his belt, Granddad began to think about retirement. And that is the point of the story at which Jesus entered the picture. After returning from Hungary, my grandparents, who were members of the Episcopal Church, though not having been to church in years, suddenly felt the need to go again. When they went to their local Episcopal parish, however, they found the doors shut and locked. Shortly afterward, an Amway saleswoman came to their house. In the middle of the presentation, she plopped a big Bible on the table and had the gumption to ask my grandmother whether or not she was “saved.” My grandmother didn’t even know what that meant. The lady then explained to her from the Bible what it meant to be born again. My grandparents started going with her to Bible study and they started praying for their son (my dad), who was involved in a New Age cult in Greenville, North Carolina. By 1978, their whole family had been born again into a new life in Jesus Christ. After retiring from the Army as a colonel in 1979, my grandfather made it his personal mission to share the Gospel with everyone he knew, starting in his hometown of Faison. One of the first men he witnessed to was on his deathbed and became a Christian shortly before passing away. “I became a roving ambassador for Christ,” he would later say, and he stayed true to that diplomatic assignment for the rest of his life. Everywhere he went — the gym, the doctor, the supermarket, or the airport lounge on the way to my college graduation — he shared the Gospel with others. Occasionally, people responded negatively to his enthusiasm, but they didn’t realize that Granddad’s primary way of showing love was to share what he treasured. To him, Jesus was the greatest treasure he had to offer. His profound generosity came through in other areas of life, too. In 1984, when my parents (who by then had moved to Haiti as missionaries) were dropped by their sending church due to a ministerial failure, my grandparents picked up the financial slack, contributing at least $500 (later $1,000) per month to my parents’ ministry from that time until now. Furthermore, when he and my grandmother built their retirement home in Fayetteville in 1994, they invited us to stay with them every summer so that we could have a free vacation. Over the years, they helped me go to college, travel to Europe, buy a car, and return to Haiti as a Bible-school teacher. They were generous in small ways, too — I wouldn’t even be able to count how many times Granddad took me out to eat or bought me gas. Toward the end of his life, Granddad settled into a life of routines. He walked a mile each day (he won a brand-new pair of sneakers by out-walking every one else at his gym one summer — true to form, he gave them away). He drove to the gas station every day and bought a newspaper. He attended the Full Gospel Businessmen’s Fellowship faithfully every Saturday morning. Every Sunday after church, he ate at the Rainbow Restaurant. 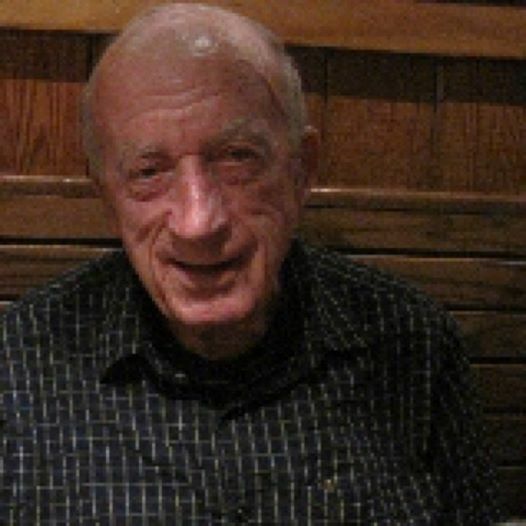 He always sat in the corner booth and every week, without fail, he would ask the waitress to meet him at the cashier’s station so he could tip her generously. Every day for years, he began and ended the day by praying and reading the Bible with my Grandmom, a routine that was interrupted over the last year or so by her deteriorating health. Last April, Grandmom’s lungs began filling up with fluid and her heart grew weak. As she came in and out of the hospital, Granddad altered his routines in small ways: refusing to let her drive alone, ironing his own shirts, eating out more so she wouldn’t have to cook, and shaking her awake whenever she fell asleep on the couch. During this time, he was so focused on her that no one questioned whether his health might be failing, too. While he occasionally complained of a sore knee (acquired from a bad landing during a parachute jump in 1957), his driving became more erratic, and his memory was slipping noticeably, he still seemed relatively healthy. Needless to say, the news on Saturday morning that Granddad had been the first to go shocked everyone. My grandmother was the first to find him. After sleeping in that morning, she walked into the bathroom and found him washed and dressed for Full Gospel, but he was gone. His Bible was still sitting on the bathroom counter. Two weeks ago, on his 86th birthday, I sent him an e-mail that ended with the words, “you are dearly loved.” He had responded with his typical exuberance, my mother wrote to say, printing it out and reading it to Grandmom, gushing about “what a fine writer” his grandson was. How glad I am that those were my last words to him! As his body gave way and his spirit made its ascent back to God, he knew that he was loved. Four years after a 7.0 earthquake that killed 200,000 people and left Haiti’s capital city in ruins, an encouraging World Bank annual report could be an indicator of brighter days ahead. At Rehoboth Ministries, we have prayed for the healing of Haiti for years. While it is important to be cautious–and while Haiti certainly has a long way to go–we have endured so much bad news over the years that any good news is is a shot in the arm by comparison. God can heal nations (2 Chron. 7:14). My eyes have seen Haiti sick, and I hope one day that they will see Haiti healed.